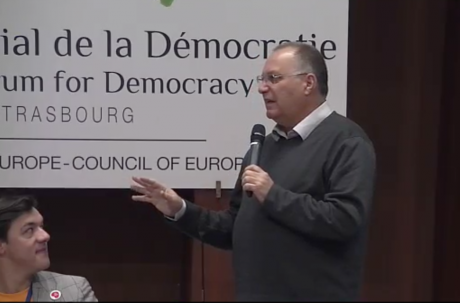 Screenshot: Yaacov Hecht addressing the Opening Plenary of the World Forum for Democracy 2016 on democratic schooling.To me it’s very difficult to sit and talk. I need to move. 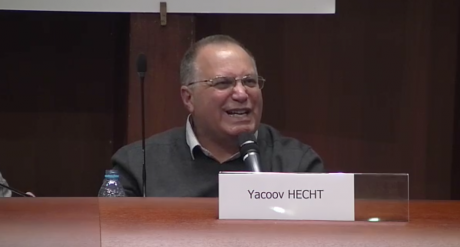 Hello everyone, my name is Yaacov Hecht and I am from Israel and 30 years ago I built a new kind of school in Israel and I called this a ‘democratic school’; and from the moment I called it thi people started to ask me why I called it a ‘democratic school’. They said, “Maybe all the schools that exist in democratic countries are democratic schools?” To me it was clear that what we call ‘school’ in all our countries is something that doesn’t understand clearly where it has come from. It has taken me some time to understand that the school that we see today is coming from the ideas of one hundred years ago; that people who want to promote undemocratic ideas built this hieratic school to prepare people to work in the factories, and be like slaves. They had the idea to build this school as we see it today. But when I say I want to build a democratic school today, I mean that in the big puzzle of our democratic societies, I feel that there is a missing piece of the jigsaw – and that this is the education, an education that promotes democracy and prepares people for the future. I fear that in schools today they prepare us for the past. But how do we build a school that prepares us for the future? That was the idea behind my democratic school. And then, for me it was like magic. Once I’d built this school there was immediately a huge waiting list. And I found myself building another, and then another, another. 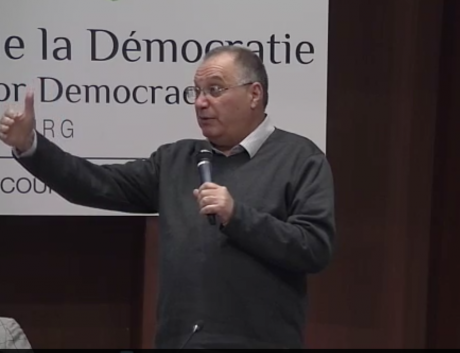 I found myself building 30 democratic schools in Israel, and then I realised that I wanted to understand what had happened in the world, and so I founded an international conference, and I call it IDEC, the international democratic education conference, and I called on innovative democratic schools from around the world to come to this conference. And today, we have more than 1,000 democratic schools from all over the world in more than fifty countries. It is an annual event, running in different countries ever year. Last year IDEC was in Finland: this year in April it will come back to Israel and all of you will come! But what is this democratic school? Look today at democratic schools around the world and you will see that in most of these schools four major rules exist. But before I explain further I should say that among these 1,000 schools, every one is different, because we believe that different is beautiful. We say there cannot be two democratic schools that are the same. But you can find these four major rules in most of them. One, we live in a democratic community. For example, my school is six hundred students between 4 years old and eighteen, and every Friday we have a meeting and we make decisions together. My vote as the Headmaster and the vote of the students is the same. We cannot change the rule of Israel, but in the law I give all the power that I have as the Principle to the community. The second thing that we have in the democratic school is personalised learning. What does that mean? It means that every student in my school chooses: what, how, where, when she or he learns. Think about the traditional school, the great idea that if you are this age, you need to learn this and this. We think that the most important thing that God created was to create us different. And school needs to continue to find out our uniqueness. But what you find in the traditional school is that they try to make us the same. At the same time, no matter how bored I am, we sit with people who are the same age and we learn the same things. In the democratic school everyone learns differently, in mixed ages. Rule number three. In our school we have a very close relationship between the staff member and the student. In most of our democratic schools students choose their mentor. The teacher doesn’t choose us to sit in his class. I choose with whom I want to be in a close relationship, and this is my mentor. The fourth rule is content. Our content that we teach in our school is from the point of view of human rights. Most of the content that is studied today in conventional schools is studied from the point of view of nationality. We study from the point of view of human rights. You understand the movement is becoming larger, we have teacher training programmes around the world and a lot of schools are beginning to tackle the idea of democratic education. When we say democratic education, we are not talking about the school remaining the same. Because a lot of people say, “OK. We are the traditional school: we work in an undemocratic way but we will teach democracy.” We say, “ This cannot work.” It cannot work. We live in the time of a shift in the paradigm. This is the time, because we have arrived at the knowledge age. Before the knowledge age, hierarchical schoolwork worked very well. But today? Something has changed. And in the last year, we have built two more projects to promote a democratic education. One is a classroom and the second is a city! Of the classroom we say, “OK , it is very difficult to change schools, especially state schools. But we have a lot of teachers who want to build a democratic education, so let’s construct a classroom of democratic education. We call it classroom 2.0. In this classroom we have only two rules – simple rules! One – simple rule – every student is a teacher. In this classroom we only study through peer learning. You know the best way to study something is to teach it? So let’s make a classroom where everyone teaches everyone. And the second rule says that we have a common challenge. What does this mean? I can take the example of mathematics. In a traditional school if we study mathematics together, we also compete with one another: asking who is the best mathematician in our classroom? This is the motivation – the driver is competition. In the classroom 2.0 we say, “OK every one of us will have a grade, but we also have a grade for the whole class.” Then the classroom becomes like a football team. It is magic. Think about this. In a football team everyone has a different role, but together they arrive at a common goal. We are now trying this in mathematics and in other classes and the result is unbelievable. Children want to learn and they want to play a game in the classroom, and to achieve together something very strong. The cooperation becomes much stronger than the competition. So this is what we are doing in classroom 2.0, and in the last seven years we have another very exciting initiative too. We call it education city. We promote a democratic education throughout the whole city. What’s the idea? The idea is: why should we only do what I’m talking about now in a classroom or a school? Let’s imagine that the whole city could become one big school. And each student can go to learn in different places in the city. Oh, suddenly there are a lot of new resources available to us. And this is something that we are exploring now with twenty cities. And it is really fascinating. Because they are not only learning inside these cities, but they are taking on the real challenges presented by the cities and dealing with them! So, after thirty years in the area of democratic education, it is clear to me that we in what we call democratic societies, we have a missing piece of the puzzle. And this missing piece is democratic education. What we need to do today is also to be clear. We need to connect what is happening outside the system now in alternative, innovative education with state education. Something needs to be connected. And what that something is that connects this up – I hope this is the challenge of this conference. I want to pick up what Professor Haddah said and repeat that I think this is the time of knowledge. We are leaving behind us the hierarchy, the time of doing what someone above me tells me to do, and coming into the time of knowledge. Knowledge is connected with networking, a networking that can only begin when we are different. And when I say different I am not only talking about the students. I think as a country one needs to dare to be different. I find international tests very dangerous: they don’t only check us out, they also force us into one direction. I want to see Israeli education being very different from Russian or Chinese education, because every one of us comes from different roots and this is what is beautiful about it. Every one of us contributes to the development of the world because we have different opinions, different roots and we are different. When I say to you that God created us different. Think for example what it would be like if God had made us no different, the same. 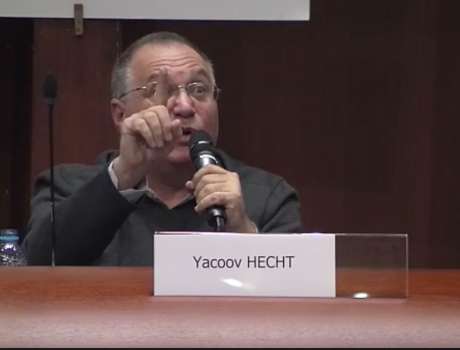 And here I was coming to talk to you in this meeting, and all of you were Yaacov! What a catastrophe! And I go into the street and everyone is Yaacov! I think it is the most beautiful thing that we are all different. And when we recognise that we are different, something happens between us. Just think how the old traditional hierarchy is always trying to find out who is the best among us… and this is a bad idea. It is not the best, the greatest, but different that is beautiful. I don’t want to see if someone is better than me: I want to learn if something is different. That, from my point of the view is at the core of what we call a democratic education. Think about schools which don’t give the student any choice. I hope they will disappear very soon. Think how for one hundred years people have been sitting in classrooms being told what to do. From my point of view this is something very catastrophic. We can explain it . OK. It was the industrial age, and people needed to go to work as a machine, so we helped them go to work as a machine. But today in the knowledge age, it is very clear that we have to help students to find their element, a place where they can connect their talent and their passion. Because in their element they have the most chance to succeed in the future. How to do it? There exist a lot of ways, and I hope there will be a net here that will enable us to share our many ideas of how to do it with one another. It is a time for sharing. The young man over there asked me how to push democratic education in your city or in your area. It’s easy, build a network around this. Don’t be alone. Find another person who wants to do it. Go and meet together and talk about this. Then find another one. And then a big group, and then go to talk with the Department of Education in your city but as a group. I think this is the time of networking. So build a network around this. Yesterday evening I sat with a huge group of young people full of ideas about how to change the education system. That, I think is the way. As for morality, in some schools that I visit around the world, they say to children that they need to sit on a chair for one hour without moving. Like this. In other places, it is five hours! And in other places it is ten hours to sit without moving, and if they begin to move they are punished. And now there is a great new idea! They give them drugs not to move. And people sit there not just for one day, but for twelve years! And that’s meant to prepare them for the future! OK – I know the people who move: I’m one of them. They don’t worry me. But what happened to the people who have succeeded in not moving? For twelve years! So these are terrible, terrible things that happen today in schools that we know. And it needs to change. School needs to be more like the hub of a start-up company, where people join together to design a project. You know Thomas Kuhn talked about the time of revolution in the sciences. When we want to improve the paradigm, if we want to make education better, we can change it. But if we want a total paradigm shift, then this is the time for revolution. So it is important to understand what we are doing now. Do we want to make a change that will improve a school? Or do we want to build new learning centres for a new environment? I’m in the business of revolution, to build a new kind of education system. But to explain this, I need to know what you know. Who knows about Blockchain in this room? This is very important. It is as if I were standing in front of you in 1995, and I asked you, “Who knows about the internet?” Some people think it is much bigger than the internet. Let me explain to you briefly about Blockchain. You know that Facebook is an excellent networking platform, where everyone can put their words and everyone can read them. But it is also the case that all the money that Facebook makes goes to someone called Mark Zuckerberg. So all of us in Facebook give money to Mark Zuckerburg. Blockchain changed this paradigm and this is why the big companies are very afraid of Blockchain. They organised a network in which everyone can get the information out that they want, and the money connects to everyone. Listen to the economists talk. 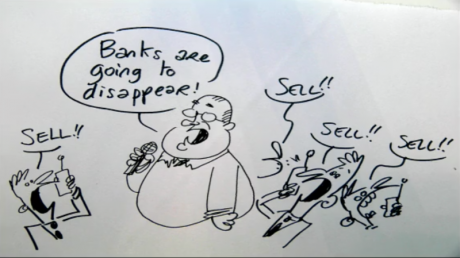 We are at the end of what we call banks: banks will disappear before schools. They have reached the end of their lives. And if we want children to learn about the future they need to understand deeply what is not far away – but within the next ten years. We need to prepare them for the work they will want to do in the future – not just to accept whatever job is on offer. To succeed in this revolution in knowledge, we need to work together. Screenshot: WFD2016 Opening Plenary. Enthusiastic voting for over 20% of the school curriculum to be decided by students and teachers together. Finally, I want to suggest a very pragmatic idea to you. But I want to check with the people here first if it is really a good idea. 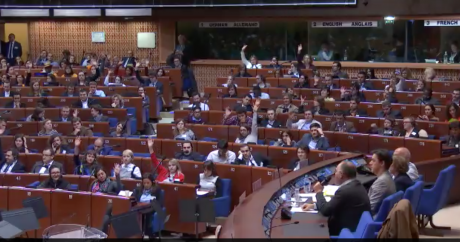 I want to suggest to you that in all the schools, maybe in Europe, students and teachers together will decide what they shall study in at least 20% of the curriculum, one day a week if you like, through a democratic process. Each school needs to decide – not the teacher alone – teachers and students also have to design a process to do it. I think this is a very strong beginning: but let’s see what you think! You can vote for less than twenty per cent, zero, or more than 20% of school time to be decided in this way. Please raise your hands those of you who think 20%. Wow! Quite a lot! Thank you. Well we are here for another two days and some people from the democratic schools will be in the Labs, in the storytelling session, and we also have a movie that is doing the rounds. So everyone who wants to talk with me later – you are welcome! Thank you.